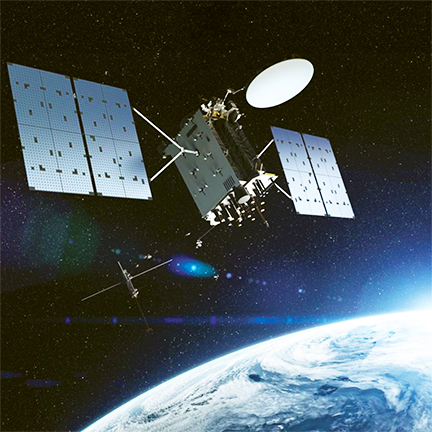 As a risk reduction effort for the U.S. Air Force’s GPS III Follow On (GPS IIIF) satellite program, Frequency Electronics, Inc. (NASDAQ-FEIM) received a contract from Lockheed Martin Space, valued at $5.9 million, for the qualification of FEI’s Digital Rubidium Atomic Frequency Standard (DRAFS) — the contract’s intent is to qualify FEI’s DRAFS for potential use on the new GPS IIIF satellites, securing the industrial base for high-accuracy Global Positioning System atomic clocks. Image is courtesy of Lockheed Martin space. To help the U.S. Air Force (USAF) modernize their GPS satellite constellation with new technology and capabilities, Lockheed Martin Space designed and built the most powerful GPS satellite, GPS III. With 10 satellites under contract, in 2018, the USAF selected Lockheed Martin to build up to 22 additional GPS IIIF satellites, adding new features and resiliency to the flexible satellite design. The USAF began launching GPS III satellites in December 2018. Today, more than 4 billion users rely on GPS. Frequency Electronics, Inc. designs, develops and manufactures high precision timing, frequency control and synchronization products for space and terrestrial applications. Frequency’s products are used in satellite payloads and in other commercial, government and military systems, including C4ISR and EW markets, missiles, UAVs, aircraft, GPS, secure radios, energy exploration and wireline and wireless communication networks. Frequency has received more than 100 awards of excellence for achievements in providing high performance electronic assemblies for over 150 space and Department of Defense (DoD) programs. Stanton Sloane, FEI’s CEO, said the company is extremely pleased to be awarded this contract and the opportunity to play a significant role in the GPS IIIF program. This award is the culmination of 50+ years of research and development of advanced quartz and atomic clocks based on FEI’s proprietary technologies. The company is also pleased to continue this long-standing relationship with Lockheed Martin Space on critical national security programs.